Tree felling and wood splitting go together like axes and wedges, and using the proper tools to turn upright trees into firewood makes the hard work go smoothly. At Buildworld, all products including axes and splitters are manufactured by reputed brands. Our range includes a good selection of models, sizes, and shapes. These have all the features necessary for high functionality and low maintenance. How to Buy the Right Axe? Tree Felling — Felling axes have longer handles and thin, sharp blades (also called bits). Their heads taper slightly and must be very sharp to cut efficiently across the wood grain. The long shaft delivers extra force at the business end of the axe. Lighter Work — The hand axe, or hatchet, offers versatility for an assortment of less difficult functions. Its lighter weight, compared to felling axes, enables you to hold it in one hand for jobs that require two, such as removing bark and cutting smaller limbs from branches. Other applications include breaking off dead branches, carving, and processing game. When working close to the ground, the hand axe is your best tool. A good axe for any purpose should have a head composed of hardened and tempered carbon steel which will hold the edge longer and maintain shape under extreme conditions. 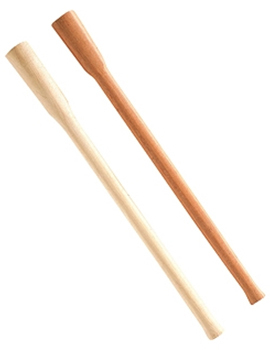 While traditional wood shafts perform well, the modern fiberglass handle offers certain advantages. They're impervious to water, super strong and never shrink inside the head. As for absorbing shock, they function about as well as their wooden counterparts. Metal — When cleaving logs into firewood, a steel splitting wedge makes the job much easier, especially if you're processing hard woods. Although soft timber, such as pine, can often crack apart employing a maul without a splitter, Splitters help eliminate second and third attempts. Synthetic — When felling trees with a chainsaw, you should opt for a synthetic splitting wedge in case you accidentally nick it with the saw. While a metal wedge can seriously damage your bar, the synthetic splitter will take the brunt of the accident and possibly spare you injury, as well.